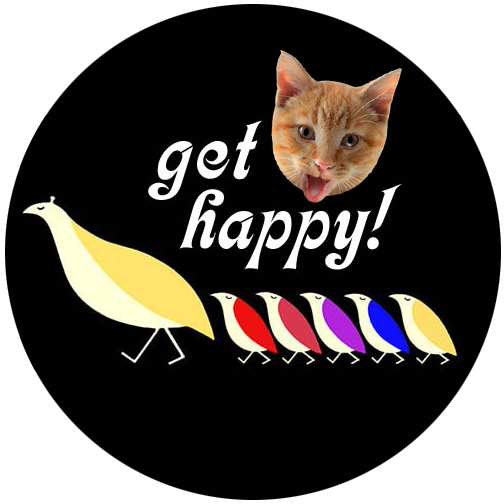 GLOGIRLY: Caturday Art Hop: C'mon Get Happy! WAFFLES: Hey Boss? Are we there yet? KATIE: No, Waffles. You already asked me that. WAFFLES: Are we there yet now? KATIE: NO, Waffles. We're NOT THERE YET! WAFFLES: Um, where are we going? KATIE: Far, Waffles. Very, very far. KATIE: No, Waffles. You can't drive to France. KATIE: No, Waffles. Much farther. WAFFLES: Should I have packed a lunch? KATIE: You mean you didn't? WAFFLES: C'mon Boss, where are we going? KATIE: The 70's called. The Partridge Family needs their bus back. Of course the theme is courtesy of Glogirly, who's an expert on cheesy 1970's television. Those Partidges better worry...Glogirly looks like she's having a LOT of trouble steering! 10 and 2, Glogirly, 10 and 2!!! Uh-oh! Is partridge on the menu? Partridge Family? Are they of the birdie variety? MOL MOL! I bet partridges are tasty! Partridges would make a nice meal! Looks as though that bus is about to serve up partridge pie! Cool Mondrian bus! You need a few more cats for the band. Waffles just think you can chase partridges now! BOL!!! hey can I get a ride? i wanna ride in the colorful waffle wagon! hehehehehe!!! I do remember the Partridge family. Love the bus. Bwaa!! Haa!! Haa!!! Yous has totally made coffee come put my Mommy's nose! I saw that bus and thought...hey that's the Partridge family bus! Sheesh, talk about a flashback! I used think David Cassidy was soooo cute! BOL!!! Thanks for the nostalgia hit! Bark More, Growl Less Barking from the Bayou! ha ha - we just love your blog. You three are so creative and crazy funny. Waffles will be eating those partridges pretty soon since he forgot his lunch! Love it! You've got your hands full Katie. Is that song from that show? That’s a fancy colored bus. I wouldn’t give it back. We love your graphics (and the very funny Waffles and Katie) stories that go with them! I'd keep the bus as a keepsake. I have their albums, watched the show always. You gave me an idea! I'm going to build my cat a cat-house or cat-bus like the Partridge Family bus.